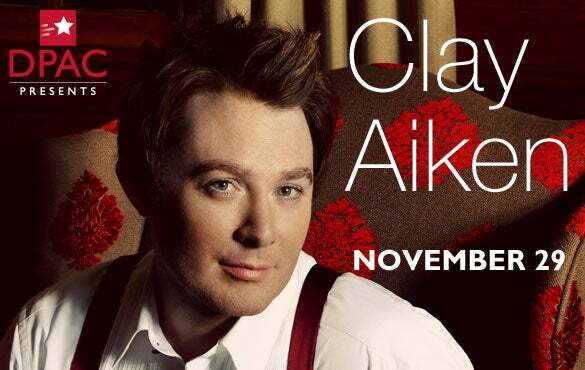 AUGUST 29, 2012 (Durham, NC) —Raleigh's own Clay Aiken will bring his Christmas special- Joyful Noise Tour to DPAC, Durham Performing Arts Center on Thursday, November 29, 2012. Triangle fans will be treated to Clay performing holiday classics accompanied by an orchestra. Clay was catapulted into household name recognition on American Idol in 2003 and has held a place in the hearts of fans young and old alike for the last decade. His recent stint on The Apprentice left viewers feeling that he was cheated out of the title. But coming in second has never been a problem for Clay, as he is truly one of the most successful runner-up prodigies to come out of the Idol stable. Clay is a recording artist- his first release, Measure of a Man, sold more copies in its first week than the debut albums of Madonna and Beyoncé, combined. He is also a writer; Learning to Sing: Hearing the Music in Your Life landed at #2 on the New York Times bestseller list and an acclaimed performer on Broadway in Monty Python’s Spamalot, garnering broad critical approval. Stardom hasn’t diminished his Southern roots- he generously gives his time and name to such charities as UNICEF (Ambassador in 2004), the National Inclusion Project, and GLSEN (the Gay, Lesbian, & Straight Education Network) and he spoke on behalf of anti-bullying legislation in front of a Congressional Committee in 2010. "Clay Aiken has been to DPAC many times, visiting backstage with friends that come through in concert or with our big Broadway shows. It's been a goal to have him onstage and this new Christmas show was the perfect opportunity. Aiken is one of our most requested artists and DPAC is the perfect setting to start the holidays with this special concert," said Bob Klaus, GM for DPAC. Clay has toured nine times, written a New York Times bestselling memoir, sold more than six million albums, produced and hosted television programs, starred on Broadway, and devoted considerable energy and resources to improving the lives of children all over the world. Fans love him, come see why when he comes to DPAC in November. Friends of DPAC members may place their orders on September 6. Joining the Friends of DPAC is free, and you can register at www.DPACnc.com/friendofdpac.